While sharing our grief over the tragedy of Sophia Travis’ passing, Democrat friends asked me to consider filling her spot on the ballot. No one can ever take Sophia’s place, but I am willing to take on this short campaign for the County Council as my way to honor her and to serve. I want to help retain a voice on the Council that promotes both transparency in government actions and listening to constituents across the county, just as she promised to do. And I need your help to do this. To tell you a bit about myself is easy. For 40 years I have lived in rural Monroe County, worked in Bloomington, and been actively involved with the local Democratic Party. With community service and campaigning for other candidates behind me, I decided to run for Indian Creek Township Board in 1994 to help resolve public-safety issues. I was elected that year and again in 1998, 2002, and 2006. I gained 16 years of experience overseeing the Township’s budgets, encouraging government transparency (there’s that word again! ), and understanding the needs of residents. This experience as a candidate and officeholder will serve me well on the County Council. in 2011, citizen member of the County Council’s Community Services Grants Committee. I am known as an advocate for residents and for our environment in other ways. When a new highway was planned across southern Monroe County in the late 1980s, I began to collect data and promote a safer and more environmentally sensible route, long before the highway was called I-69. Now, 24 years later, I’m still speaking out about the highway’s safety issues and impacts on our county’s historic districts. Dedication is the cornerstone of my public service. Over the years, my service to the community connected me with people serving throughout the county at Planned Parenthood, PTO/PTO Council, MCCSC committees, 4-H, volunteer fire department, community association, Scouts, booster programs for youth sports, choir, theater, and even those growing vegetables for food-security programs. In sharing this work with others, I gained a better understanding of what residents expect and need from their county government. I am accessible and approachable, and I will be responsive to constituent concerns. My husband, Patrick Munson, and I are rooted in Indian Creek Township, where we raised our children and are now active grandparents. In my professional life, I am an archaeologist and research scientist in the Department of Anthropology at Indiana University. This work is relevant to the Council because it provides me years of experience in collecting and analyzing information, developing and managing detailed budgets, and advocating at the Statehouse and in Washington for new initiatives or improved procedures for protection of heritage resources. Equally important, my research takes me to all corners of Monroe County. I know our hills and hollows, our natural and built environments, and what is durable, what is fragile, and what is in need of attention. In 2010 I ran for County Council in District 2, which at that time comprised the southern and western townships of the county. Although I did not prevail in this highly Republican area, I was heartened by a strong showing in many of the precincts and again planned to run for County Council At-Large this past May. A crowded field of incumbents, including my 2010 Campaign Chair Warren Henegar, led me to change my mind. Attend to the fiscal responsibilities. Setting County budgets is an exercise in understanding community values and setting priorities. Restructuring county government for greater efficiency can best done in a collaborative manner with Department staff and officials. Preserve our valuable resources. We must strive to ensure that the natural, cultural, and government resources that residents care about and depend on, and that make our county the best in the state, are protected. Guide our growth. Our county should grow in a way that is sensible and manageable. Immediate growth concerns include the public safety and transportation-connectivity issues brought by I-69. Expanding tourism will generate revenue and support economic growth, as well. I will work collaboratively on the Council to help shape our county’s future and to keep the concerns of county residents at the forefront. Sophia and I shared a caring approach and a willingness to listen, collect information, and then to act. Although I have my own style and my own priorities, I will maintain this same approach. I hope you will lend me your support in this very short campaign. With your help, I will win in November and honor Sophia the best way that I can: by ensuring that we maintain a Democratic majority on the Council, with a focus on service to the public. I hope you had a chance to read Rick Dietz's message about the tragic vacancy left by Sophia Travis' passing, and the plan to fill the upcoming ballot vacancy. I have agreed to be appointed by our Chair to fill the County Council ballot position, if Rick is given this authority by the Central Committee, to honor Sophia. No one wants to run in such circumstances, but there is an important "job" on the County Council that Democrats in our community cannot ignore. Due to the tragic passing of candidate Sophia Travis, there is a vacancy on the ballot for Monroe County Council At-Large. As of Saturday morning absentee ballots are required to be mailed to voters with Sophia's name on them and that will continue until a successor is named. After consulting extensively with the Indiana Election Division, The Indiana Democratic Party, former MCDP Chairpersons, MCDP officers, precinct committeemembers, and several attorneys, the best course of action was to call a party meeting to secure appointment authority at the soonest date possible, Friday 28th. Precinct Commiteemembers have received an official invitation and letter to this effect by now. Adopting a resolution authorizing appointment authority will allow me to place a new name on the ballot at the soonest possible date. This has been a horrible experience for all of us. I want to thank Dan Parker, Sarah Riordan, Jan Ellis, Pat Williams, Lee Jones, Trent Deckard, Guy & Connie Loftman, and our MCDP officers (Kyla, Hans and Nicole) for their assistance working through this complicated and unpleasant business. In accordance with Indiana Democratic Party Rules, I have called a meeting of Democratic precinct committee persons for all Monroe County precincts for the purpose of authorizing the Monroe County Party Chair to have appointment authority for this vacancy. The meeting will be held on Friday, September 28, 2012 at 7:00 pm in the Bloomington City Hall Council Chambers at 401 North Morton Street, Bloomington, Indiana. I realize the this isn't a good time to have a meeting, but time is of the essence, and it will be quick. All Monroe County Democratic Party precinct committeepersons are invited and eligible to vote at this meeting. Vice precinct committee persons shall be eligible to vote if they are carrying a proxy for an absent committee person in accordance with Indiana Democratic Party Rules. Proxy notes may be presented to me at the meeting. A majority vote of Precinct Chairs present at the meeting is sufficient to authorize appointment authority by resolution. Any questions about this meeting can be addressed to me at chair@monroedems.org or at 812-671-0076. Thank you for your support and understanding as we navigate this difficult period and press forward with our Fall elections. I will send out a statement from Cheryl soon. I have sad news that I can barely bring myself to write... last night Sophia Travis passed away. Sophia was a dear friend, a community leader, a creative & musical spirit, and a caring mother & wife. Sophia had suffered since early in the year from an undiagnosed heart-related condition and had just returned from the Cleveland Clinic where she, Greg and young Finnigan had travelled for care. Sophia personified kindness -- a dense gravitation kindness -- and wielded a gentle strength that could move mountains. And move all those around her. And did many times over. There are times when one wonders how this world can just keep turning with loss after loss we can hardly bear. Please keep Finnigan, Greg and all of Sophia's family and friends in your thoughts today. Local Democrats Need Your Support Today! There is no doubt that 2012 will be a historic election for Monroe County, for Indiana and for our Nation. Four years ago, for the first time in decades, the concerted effort of Democrats across the state put Indiana in the Democratic column. Although 2012 is a very different year, we have opportunities to wrest Governor, Senator and Congressional seats from Republican hands and maintain strong Democratic leadership in Monroe County. There are communities larger than us in Indiana, but none in Indiana speaks with as bold and strong a voice as Monroe County and Bloomington. Monroe County is pivotal to Election night victories in the 9th Congressional District, Indiana Governor and US Senate races. If we do not turn out our Democratic base, we will be poorly represented for two, four and six-year terms. to fund our day-to-day headquarters office expenses. Our strength, our vision, and our hard work could very well be the margin of victory in the 9th District and Indiana statewide offices. It has been said that all politics is local. But too few of the donations are in a year like this. In order to seize this opportunity to shape our state and national parties and our state and national politics, we need your support! PS In the most critical races on the ballot, the difference between Red and Blue is you. $10 will purchase copier paper, $50 dollars will help us provide Voter IDs to those in need, $100 will help pay our utility bills, $500 will purchase a computer for data entry at our phone banks, and $1000 will pay a month’s rent. Become a member of the Monroe County Democratic Party today! We need you. On Monday Sept 10th at 7PM the Monroe County Democratic Party held a caucus at the Bloomington Convention Center to fill the County Council At-large seat left vacant due to the passing of Warren Henegar. The term ends December 31, 2012. This Monroe County Democratic Party caucus was chaired by Rick Dietz with the assistance of Kyla Cox and Nicole Bolden. John Irvine spoke in remembrance of Warren before the official caucus proceedings. Alice Eads was the only candidate to file for her father Warren Henegar's seat. At the caucus Alice Eads was elected to serve the remainder of the term for Monroe County Council At-large effective today and in time for County Council Budget Hearings. We congratulate Alice on her victory in the caucus and for her willingness to serve. She was sworn in at the Caucus and begins her term immediately. On a sad note, we will be holding a caucus of Democratic precinct committee persons for all Monroe County precincts for the purpose of filling the position of County Council At-large vacated by Warren Henegar. The term ends December 31, 2012. The caucus will be held on Monday Sept 10, 2012 at 7:00 pm in the Bloomington Convention Center, Duke Room, at 302 South College Ave., Bloomington, Indiana. All Democrats are welcome to attend the caucus. All Monroe County Democratic Party precinct committee persons are eligible to vote in the County Council At-large election. Vice precinct committeepersons shall be eligible to vote if they are carrying a proxy for their committeeperson in accordance with Indiana Democratic Party Rules. Proxy notes may be submitted to me ahead of time or at the Caucus. Email shall be acceptable for the submission of a proxy statement. Candidates for County Council At-large must be eligible to be a candidate for County Council At-large. Candidates must file form CEB-5 with the Caucus Chair, Rick Dietz, 72 hours before the caucus – by 7PM on Wednesday Sept 7, 2012. Any questions about this caucus can be addressed to Rick Dietz at chair@monroedems.org or at 812-671-0076. 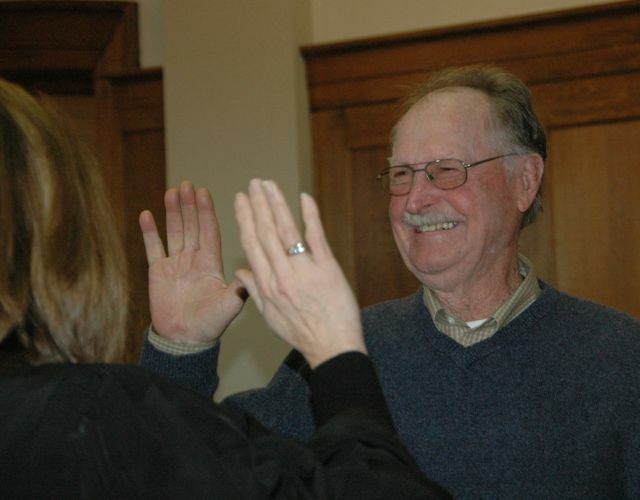 As you've heard, Monroe County Council Member Warren Henegar passed away yesterday morning. Our deepest sympathies are with Warren's family, friends and fellow adventurers throughout the years. Much has and will be said about Warren. He leaves a legacy of service and a life well-lived that should be an example to all of us. I know him from a small fraction of his life as a farmer and a colleague on the Monroe County Council, but if it can be said of anyone it can be said of Warren: he contained multitudes. His presence will be deeply missed, but it will continue to be felt in our community, in our lives, in the land. I want to share with you that there will be a visitation on Monday, August 27, 5 to 8 p.m. at the Monroe County Courthouse, 100 W. Kirkwood, Bloomington, Indiana. In addition a memorial will be held at the Meetinghouse of the Bloomington Religious Society of Friends, 3820 Moores Pike, Bloomington, IN, on Sunday, October 7 at 2 p.m. These links below will take you to articles in the Herald Times about Warren and his obituary, including the Henegar-esque request that in lieu of flowers, Warren asks that you pay your taxes without complaint. We could use the help of an experienced plumber to remove a drain clog. We'll need a snake for this..
We can use 2 additional AC units for HQ upstairs areas. We need folding chairs too. If you can donate or provide us with any of these items for our HQ please call our HQ Coordinator Sandy Churchill before you donate or deliver. Sandy will coordinate incoming items and plumbing activities: 336-5875 or churchillsandra@gmail.com. About a week ago Andy Alexander submitted his resignation form the Indian Creek Township Board. Under Indiana law the relevant County party chair is required to make an appointment for that office since there is only one precinct in Indian Creek Township. I am proud to inform you that I have appointed Meri Reinhold to serve on the Indian Creek Township board. As you may recall Meri ran a strong race to serve on this board in 2010. Now she has that opportunity, and just in time for budgets! Good luck, Meri, and thanks for your service!